Some of you I have already met and some others may recognise me from wee gigs I’ve done at Letham Nights already. I also featured with Herbert The Tortoise in the recent Prezi for The Observer 50 Radicals. I have since been invited to join the LN committee. Following our first committee meeting proper last Saturday it has been decided that amongst my duties will be the spreading of the word south of the Forth. With this in mind I set out this afternoon with my stash of posters and a good swedge of blu-tac (other brands of sticky wad are available of course). 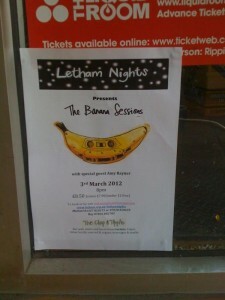 I’m really looking forward to seeing The Banana Sessions and Amy Raynor in a couple of weeks. I’ll also be on the lookout for fresh talent in Edinburgh with future LN bookings in mind so please get in touch if you’ve got the licks, riffs and/or chops. Make sure you check these guys out on 3rd March. It’s gonna be mega! October is Oxjam month when music events across UK are dedicated to raising money for Oxfam. Letham Nights will be supporting this campaign with a fantastic open mic night on Saturday 1st October at 8pm featuring a talented array of acts as well as a set from Edinburgh band Buckley’s Chance. If you would like to reserve a ticket, contribute to Oxjam or offer to perform at the open mic session, please use the contact details opposite to let us know! David has been touring the UK and will finish a series of gigs taking in England, Glasgow and Edinburgh at Letham Nights. A pop-up with (wedding) bells on! The craft shop will be back with (wedding) bells on! Following a successful pop-up at the November 2010 Letham Nights, craftscotland are presenting a range of gifts fit for any wedding pressie list. There will be rings from Jane Gowans who recently completed a year long artist-in-residency at Duncan of Jordanstone College of Art and Design in Dundee. Local lass Claire Heminsley’s tea towels, which are designed in Letham, hand printed in Edinburgh and each have their own story printed on the label, will be available to buy on the night. We will also be introducing ceramicist Cosima Sempill. Cosima’s work is featured in the current edition of Real Life Weddings magazine after she created 150 ceramic favours for her brothers wedding last year. 25% of all sales go towards the running costs of craftscotland, the national agency which promotes Scottish craft, and 25% of all sales are donated to Letham Nights. So whether you are looking for a wedding present or feel like treating yourself to something handmade in Scotland, make sure you bring cash to the pop-up shop as it’s cash only sales. 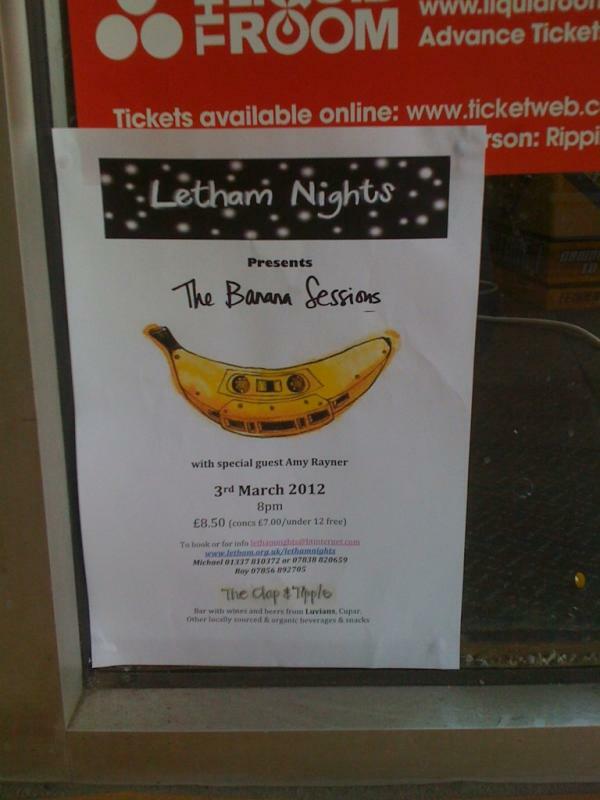 The ingredients of what makes a good Letham Night are hard to define but on 28th November, we got it right once again. The raw energy from the Bum-clocks and the sheer joy of Luva Anna combined with the irreverent humour of both bands gave us all another fantastic evening. Is Tam Burn, lead singer of the Bum-clocks barking? Well he certainly was at Letham Nights #9. With a howl and a wuff , he introduced the first number in their brilliant repertoire in the guise of a demented dalmation and away we went – Iggy Pop meets Rabbie Burns in ‘A Tail O’ Twa Dugs’. “Noo ah wantae be yer dug” chants Tam, as Malcolm Ross’ jagged guitar and Russell Burn’s driving rhythm on the drums carry the song along. To our delight, we find that the relationship between the bard and other contemporary musicians is a strong one – ‘Lang Lang the Night – Panic in Detroit’ turns out to be a collaboration with Burns and Bowie. The band have been supported in their musical and poetic venture by the Scottish Arts Council as part of the Homecoming Celebrations. And what a brilliant way to weave together a simultaneous tribute to Burns and the godfather of Punk, Iggy Pop! No tired tartan formulas here but creative, genuinely poetic, entertaining and very, very funny . Thanks to the Bum-clocks for gracing the stage at Letham Nights. Now over to Roy for the Luva Anna review…. Whilst sorting out the music for the Dundee College fashion show in June, Claire handed me a CD that one of her students had submitted for review and asked me what I thought. I popped it in my HiFi and within two tracks we knew that the answer was a no for the Fashion Show but an absolute, indisputable YES for Letham Nights. A wee bit of ‘tinternet trawling confirmed my suspicions. 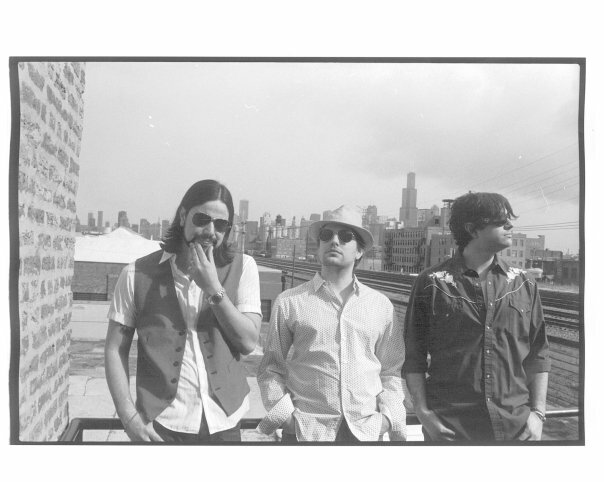 This is a young band with a unique sound and exuberance that most established stars would kill for. Finalists in the Channel 4 “Orange Unsigned Acts” show, playing 200 gigs over the last two years, they played festivals like T in the Park, the Wickerman, Rock Ness, and Connect. They also supported The View on the Acadamy Tour. Busy boy’s indeed. It took a bit of ducking and diving to find suitable dates as they and Letham Nights have full books for some months ahead. That date was the 28th November and I will remember what I did on this momentous night for, well, a very long time…. The set started with Sea Shanty, a fabulous four part vocal harmony with a folky twist, seamlessly moving into Hold On, an amazing vocal delivery from Dave Webster reminiscent of both the Buckleys, Jeff and father Tim. Truly goose bump stuff. They then fired into a set of rhythm, pace, subtlety and harmony. Delivering each sonic ingredient with power and charm, catchy melodies and solid riffs, they played songs from the self titled Luva Anna and Made Without Compromise CD’s. Amongst Coma Girl, Dumba Dumba, Angry Fat Bouncer, Sober, The ballad of Boaby Smith, Arthur McBush, Bonny Little Girl and Granton on Spey they dropped in a few new numbers like Time to Laugh and Postcards. Dave and Drewboy Gray shared the main vocals and Guitar parts, Robbie Ward on bass, bouzouki and bass pedals (the latter two, simultaneously), and Billy Fisher’s fantastic percussion. Superb musicians and vocalists, one and all. Almost two hours later we were all wondering two things, why is the band not totally massive and where are they playing next? I’m not sure but I’m told that all the CD’s for sale were snapped up within 10 minutes of the gig ending. Once again Geoff the PA man supplied us with superb sound for the gig. The “Clap and Tipple” provided the bar, keeping the thirsty crowd suitably quenched with a fine selection of organic, local and fair trade beverages and buxom serving wenches. Only a few days to go before the Chloe Hall Trio come to Letham Nights. It is going to be a fantastic night. Tickets are selling so get yours now! You can usually pay on the door but it helps us a lot if we know who is going to make it…. The band have finished their tour of Canada and are now in Ireland. They play some gigs there and then head for Scotland where they will play the Falkirk Folk Club and Caberet Voltaire in Edinburgh before coming to Letham Nights. This is a major scoop for our village hall. Don’t miss it! Reply now to book your tickets! ps Don’t forget that 12th Sept is a Letham Village Hall Coffee Morning from 10-12noon. All welcome.